David Fincher, in my opinion is a movie-making genius. He hasn’t made, what one would call, a LOT of movies, but each and every one he has made has stood out. I’ve seen all his full-length features to date. From Se7en to Fight Club. Now, I know many people will disagree with what I’m saying, but, in my opinion, Zodiac is his best. In the late 1960’s through till the late 1970’s a notorious serial killer who called himself The Zodiac haunted the San Francisco Bay Area. It is not known exactly how many murders he committed. For the purpose of publicity, he used to mail letters and zodiac codes to famous newspapers in the city giving them information which only he could know, taunting the Police to carry out a mass investigation. Till date, the case remains one of the greatest unsolved crimes of San Francisco. The movie is based on actual case files, and adapted from Robert Graysmith’s Zodiac account books. I saw Zodiac, in the dark confines of my room. It is a two hour thirty-seven minute movie. It felt no more than ninety minutes. I hold the background music as, perhaps, the most important factor in getting the viewers into the basic feel of the movie. Zodiac has got a blend of 60’s Jazz, Pop and Rock music. Even the closing credits have got music enough to make you remain seated and hear it out. It has a gripping background score. The film starts, and ends, with the same song. The song: Hurdy Gurdy Man. It is stylized, almost scary, along with a nod-your-head vibe to it. The movie has an ensemble cast. With the likes of Jake Gyllenhaal, Robert Downey Jr., Mark Ruffalo, and Brian Cox, the acting is stellar. Ruffalo’s portrayal of Inspector David Toschi is the pick of the lot. Gyllenhaal, playing the role of Robert Graysmith, a cartoonist for the San Francisco Chronicle whose obsession with The Zodiac leads to the most striking amount of evidence in the case, carries on the express that he started with Brokeback Mountain. I have never seen Chloe Sevigny’s other avatar, but her coldness shines in every scene we see her. The whole 1960’s/70’s setting merely adds to the excellent screenplay. The film has a black imagery. The only clear amount of brightness we get is in the first five minutes, coming from a flashlight. The dialogue is gripping. The delivery is perfect. The screenplay is sublime. Everything is just right. The cinematography, the setting, the direction, just fits right in. There was not a moment during its length that I looked at my watch or thought that it was long. It is edge of the seat stuff. The movie is perfect. 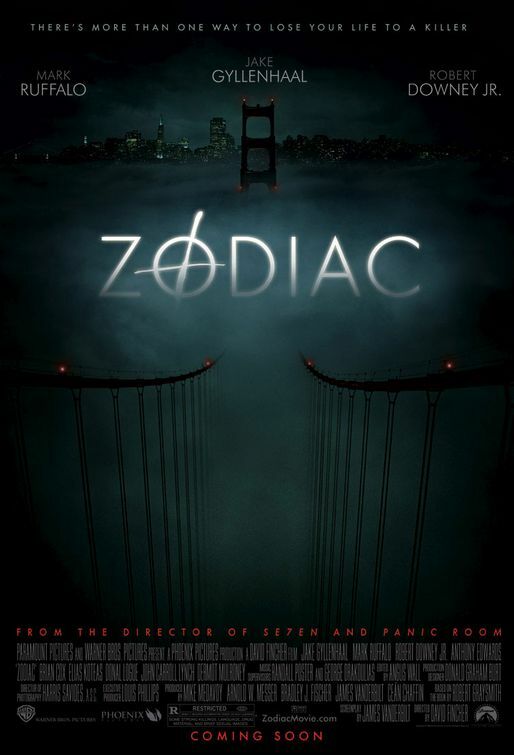 I didn’t know much about the Zodiac killings till I saw this movie. It interested me enough to spend a day reading whatever I could find on the net. When a movie gets you to do that, it says something. For all that its worth, I cannot find a single reason why this movie was overlooked at the Oscars. If this isn’t Oscar material, I’m not sure what is. By the time the movie ended, Zodiac left me stranded with a million random thoughts jumping in my head. It’s a thriller of amazing proportions. It just gets you. Whether it is Downey Jr.’s stylized portrayal of an engaged reporter, shifting to a drunkard who doesn’t really give a damn, or the very voice of the Zodiac over the phone. The opening sequence, 5 minutes long, only sets you up for a treat of a movie. Brilliant. Absolutely brilliant. Watch out for the opening sequence. It rocked me to my core. Highly recommended to anyone who loves watching movies. Thumbs up!